Marketing, Social Media, Banking, Insurance, Public Administration and Management spheres etc, Department intends to provide internship programme and fellowships. Interaction with young scholars will provide new ideas and research support from the field of Academics. At the same time, it will provide an opportunity to young scholars to contribute to the Department and provide an insight into working of the Government. Several academic institutions and young scholars have expressed a desire to contribute to the Department. The Department of Posts is of the view that an Internship Programme will ensure interaction of the Department with Young Indian scholars with sound academic background from reputed Institutions in the country and will also allow them to understand the postal industry. This programme seeks to engage students pursuing Under Graduate/Graduate/Post Graduate Degrees from recognized University/Institution within India as "Interns”. These interns shall he given exposure through various Circles/Divisions of Postal Directorate. A list of domain/areas for which Internship is invited is enclosed as Annexure ‘A’. For the “interns” the exposure to the functioning of the Indian Government may be an add-on in furthering their future interests. iii. ”Applicant on Internship” is a person, who wants to work, for mutual benefit, with the Department on a full-time basis with the sole purpose of enriching his knowledge in the area of expertise. iv. ”Area of Expertise" means the subject or area in which the applicant possesses expertise and wants to enrich it further. a. Who have completed education under 10+2+3 pattern of education i.e. students who have completed 15 years of formal education. b. Who are pursuing 3rd year in the Business studies and Engineering in 10+2+3 pattern of education. d.. Who have completed 2nd year of Software Engineering in any IIT/NIT or 13t/ 2nd Year of Business Studies in any IIM/ recognized Management Institute. ii. Possessing minimum qualifications as above shall not guarantee Internship in the Department. Candidates having exposure in the area of intended internship with good academic background and having higher qualification, based on need shall be given preference. The duration of internship shall be of one (1) to two (2) months. Interns not completing the requisite period will not be issued any certificate. notice on its website requesting Intern applications. ii. In case a candidate is willing to pursue his/her internship in a specific Circle, application/CV may be sent by post or submitted in person to Chief Postmaster General of that particular Circle. iii. Circle Offices can also identify interns for specific area based on inquiry from academic institutions. iv. A candidate can apply for internship only once during a financial year. v. At the time of joining on selection, applicants shall be required to produce a letter from their Supervisor/ Head of Department/Principal, indicating their status in the Institution and “No Objection” for allowing their student to undergo Internship programme for the period for which he/she has been selected. i. The applications received for internship in Circles will be scrutinized in the Circle for selection. The applications related to Directorate will be scrutinized by BD & M Directorate only. a. At Directorate, the selection committee will consist of Chief General Manager, BD & M Directorate and General Manager (P&L). b. At the Circle level, the selection committee will consist of Chief Postmaster General and an officer in the rank of IAG or above. c. The selection committee may conduct personal or telephonic interview, if required. No TA/DA shall be paid to candidates for attending the personal interview. iii. After selection of the candidates, the concerned Circles will send the offer of internship directly to the selected candidate. The offer for internship in various Divisions of Postal Directorate will be given by BDM Directorate. iv. The Circles can take maximum of 2 (Two) interns for Internship at a time in a particular domain/area as given in Annexure A.
v. Depending on the number of applications received against a particular domain/area, Department reserves the right to fix up the eligibility criteria, limit the number of applicants to be called for a particular period and to decide about the mode of screening thereof. vi. The attendance record and the details of work supervision shall be maintained by the Circle/Divisions of Directorate. Interns will be required to have their own laptops. The Department will provide them working space, workplace internet facility and other necessities as deemed fit by the concerned Heads. i. The Intern shall follow the rules and regulations of the Department that are in general applicable to employees of the Department. ii. The Intern shall follow the confidentiality protocol of the Department and shall not reveal to any person or organization confidential information of the Department, its work and its policies. must not be revealed under any circumstance. iv. Any papers and documents written and/or published by the Intern should carry the caveat that the views are the personal views of the intern and do not represent or reflect the views of the Department. v. Interns will follow the advice given to them by the Department regarding representations to third parties. vi. In general an Intern may not interact with or represent the Department vis-a-vis third parties. However, some Interns may specifically be authorized to interact with third parties on the behalf of the Department depending on the nature of their roles and responsibilities. vii. No Intern shall interact with or represent or comment about the Department to the media (print and electronic) including social media and personal Facebook/ twitter handles. viii. Interns will conduct themselves professionally in their relationship with the Department and the public in general. ix. It may be strictly observed that the conduct of the interns and their access to data shall be the sole responsibility of the concerned Advisors/Heads only. x. Any work done for the Department by the intern during the period of Internship will be the sole property of the Department and Department reserves the right to use any such work for its own purpose. i. The interns would be attached with one of the officers of minimum ITS rank in the concerned Circle/Division of Directorate. ii. The internship is neither a job nor an assurance of a job with the Department. i. Work Plans and work schedules shall be developed by supervisor and the Interns shall invariably adhere to the same. ii. 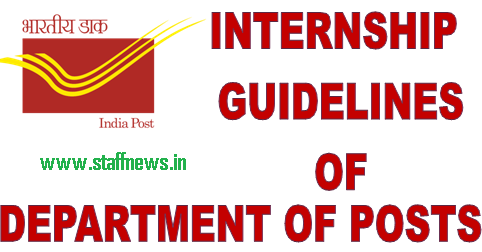 The Interns will be required to submit a Report/ paper and give a presentation on the work undertaken at the end of the internship to the respective Heads of Circle/Head of respective divisions in Postal Directorate. Report shall be signed by the officer with whom intern is attached. iii. The Interns will also be required to give their mandatory feedback to the concerned Head of Department on their experience of the programme, monitoring and supervision. i. Interns may be paid token remuneration @ Rs.10, 000/- per month per intern. ii. Eligibility of candidate for payment of remuneration will be decided by selection committee while selecting the candidate. iii. The remuneration shall be paid after the completion of Internship on submission of Report duly accepted by the Heads of Circle/Heads of Division of Postal Directorate which shall be countersigned by at least JAG Level officer of that unit. iv. The remuneration shall be paid by the respective Circle/BD & M Directorate from the existing allotment in Budget Head 3201.01.001.02.01.28 PPS (Non Plan). Interns will be required to furnish to the Department a declaration of secrecy before reporting for the Internship. Certificates will be issued by the respective Circle/BD & M Directorate to the interns on the completion of Internship and submission of Report duly countersigned and accepted by the competent authority as stated above in Para 10 (ii). i. The Department may disengage from the Intern if the Department is of the view that the services of the Intern are no more required. ii. In general the Department may terminate the services of the Intern at any time without assigning any reasons and with immediate effect. iii. In general, if the Intern decides to disengage from the Department, he should provide 2 weeks’ prior notice. Notice period may be waived by the supervisor depending on the role of the Intern. iv. Upon, termination, the Intern must hand over any papers, equipments or other assets which might have been given to the Intern in course of his work with the Department. This will include any badges or ID cards which may have been issued to the intern. v. If it comes to the notice that the person whose services have been terminated by the Department continues to act in a manner which gives an impression that he is still working for the Department, the Department shall be free to take appropriate legal action against such person. I certify that the above information furnished by me is true to the best of my knowledge and belief. I also agree that in the event of any misrepresentation and/or falsification of information, my internship shall be liable for termination without notice and without prejudice to any other administrative/legal proceedings that Department of Post may deem fit to initiate. This is to certify that the information furnished by Mrs./Ms./Mr.... ... ... ... ... ... .... .... ... ... ... ... .... .... .... .... .... .... .... in the application form above is correct to the best of my knowledge. This is regarding internship guidelines of Department of Posts for engagement of students pursuing Under Graduate/ Graduate/ Post Graduate courses from recognised Universities/ Institutions as Interns. 2. The detailed guidelines on the subject are enclosed. This program has been conceptualised with a view that engagement of these interns will provide many positive insights to the Department from an external perspective. Accordingly, it is requested that all concerned may take benefit of this program to engage interns in domains/ areas identified for the purpose.